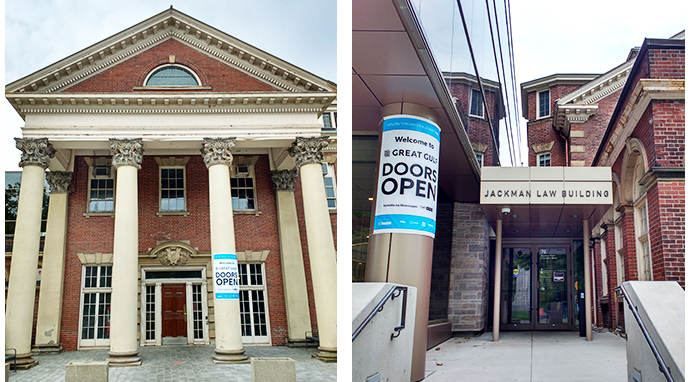 The new Jackman Law Building was part of the annual Doors Open festival for the first time on the weekend of May 26-27, along with the historic Flavelle House. Doors Open is an annual event where notable buildings in Toronto open their doors to the general public, with the visits often enhanced by volunteers, information and programming. 'A Meeting Place for All Our Relations': Something worth celebrating! Read more about 'A Meeting Place for All Our Relations': Something worth celebrating! 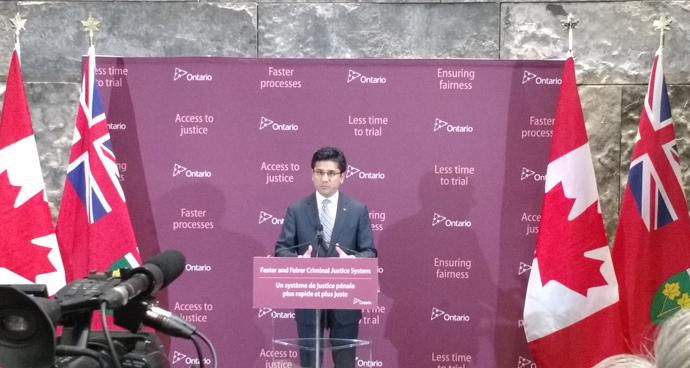 Ontario Attorney General Yasir Naqvi came to the University of Toronto Faculty of Law this morning to make an important announcement about new steps to improve the province's criminal justice system. The official cut: (L) Lucas Hildebrand, student gonfalonier, Campaign Co-Chair Tom Rahilly, Chancellor Michael Wilson, the Hon. Hal Jackman, Dean Ed Iacobucci, Governing Council Chair Shirley Hoy, the Hon. Chrystia Freeland, Minister of International Trade with President Meric Gertler, alumnus and MP Arif Virani and Christina Liao, student gonfalonier. 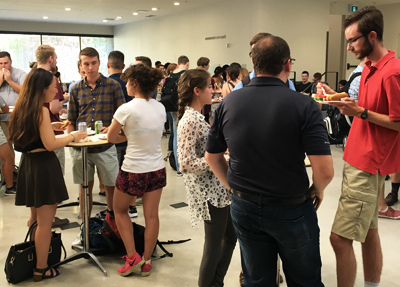 Hundreds of law students, faculty and staff packed the foyer of the Jackman Law Building (JLB) in one of the best turnouts ever for the annual Dean's Welcome Back BBQ, in its inaugural year in the well-appointed and spacious Osler, Hoskin & Harcourt LLP Atrium. First international conference hosted in the new Jackman Law Building: attendees of the joint International Journal of Clinical Legal Education (IJCLE) and Association for Canadian Clinical Legal Education (ACCLE) conference in the Osler Hoskin and Harcourt LLP Atrium. The Jackman Law Building and Faculty Renewal design by Hariri Pontarini Architects (HPA) and B + H Architects has landed a Canadian Architect Award of Excellence for 2013, one of six announced today in Canadian Architect magazine.